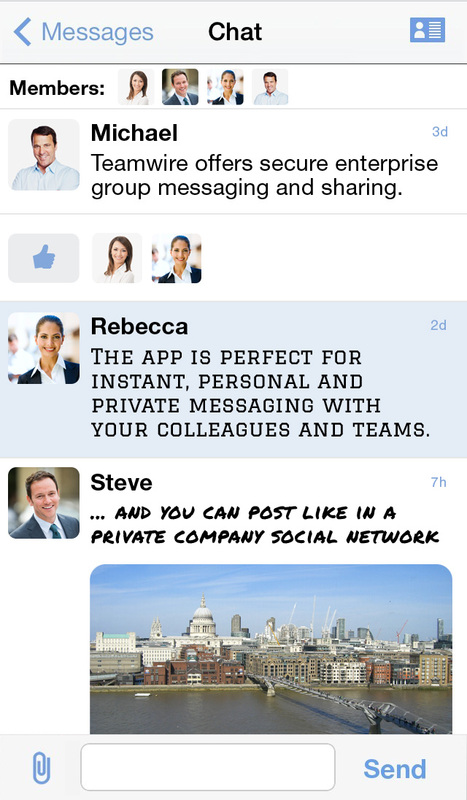 There is a relatively new enterprise messaging app called “Teamwire“. The app is a fast, easy to use and secure app for all internal enterprise messaging needs. Basically the goal seems to be to offer mid-sized businesses and large corporations a secure and enterprise-capable messaging app with a clear focus on mobile devices. Within corporations employees often use Whatsapp or similar consumer messaging apps to quickly reach colleagues, discuss topics in real-time, drive work and make decisions. Email with its crowded and overflowing inboxes is too busy and not capable of these tasks anymore. Besides on mobile devices users prefer simple and easy to use apps, which are fully integrated in the mobile operating system for additional features. However, messaging apps like Whatsapp are not secure and violate corporate IT compliance. As an alternative there are business messaging services (also referred to as unified communication services). While there are many business messaging services available (HipChat, Lync, Hall, Sametime, Slack, etc. – just to name a few), most of them come from the PC world and lack a focus on mobile devices. Furthermore, most of them focus and small and medium businesses, and are not enterprise-capable. If they are enterprise-capable (like e.g. Lync), their strengths mostly rest in VOIP services and online meeting tools. Thus, there is no dedicated enterprise messaging app or a “Whatsapp for enterprise” yet. This seems to be the goal of Teamwire. First, there is what Teamwire calls a visual inbox. This enables users to easily start new chats for different topics, and thus avoids the mixing of conversations in one chat only. Especially for group messaging this is great, and since group messaging is a major business use case, this is quite an important feature. Another advantage of the visual inbox is, that users can post status updates and therefore are able to easily share news like in a company social network. Second, Teamwire has read receipts – not only on an individual but also on a group level. So you can exactly see which recipients of a group message have seen your message. Third, the app offers on-click distribution lists. Users can set-up lists for their team, unit, group or anything they like, and then message and share with these colleagues with one-click. Fourth, users can easily share calendar dates as well as files. Again, these are important business use cases. However, the main differentiator of Teamwire are the security and administrator features. The service is completely encrypted: The transmission, the meta data, the messages, the content and the storage on the servers. As a German provider Teamwire complies with strong German and European data protection laws (e.g. anonymizing user data, no address book storage, etc. ), and all data is stored in Germany only. In addition, Teamwire offers an administrator portal. The portal enables enterprise IT to manage all users, define communication rules (e.g. closed communication groups to protect distribution of content), and archive messages. In order to fully comply with enterprise requirements, Teamwire also supports the enterprise mobility solution of the leading mobile device management vendor “MobileIron“. As a deployment option, Teamwire offers a private cloud solution or an on-premise solution (based on the information of the Techcrunch database). This is quite interesting, since everything moves to the cloud nowadays. Teamwire seems to bet on the enduring on-premise requirements of large corporations. 1. Is the transmission of the messages and all communications between the app and the server protected with an SSL encryption? 2. Are the messages and content end-to-end encrypted? Meaning: Only the sender and the receiver of a message can read it (this is quite important)? 3. Are the messages stored in a completely encrypted form on the server? 4. Is the provider not able to read the messages on the server? 5. Does the provider completely anonymize user accounts, messaging logs and profiles, and thus fully protect the privacy of users? 6. Your address book data is only stored on your device, and not stored on the servers of the provider? 8. Is there a regular backup of the data on the server? 9. Is all data stored on servers outside of the USA (where it cannot be easily accessed by US government agencies)? 10. Is the provider of the messaging app based outside of the USA (again: thus cannot be easily accessed by US government agencies)? A lot of messaging apps claim to be completely safe and encrypted. However, there are huge differences between providers as you can tell by this questionnaire. Not a lot of apps can answer all questions with YES. You will have to judge by yourself, what questions and topics are most important for you, and thus select a private and secure messaging app for your needs.